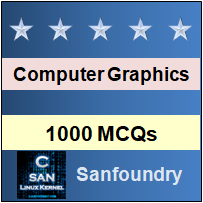 This set of Computer Graphics Multiple Choice Questions & Answers (MCQs) focuses on “Character Generation”. 1. Which of the following is a video editing tool that produces an animated text which can be inserted into video streams? Explanation: Character generator also called as CG in video editing is the software or hardware that produces animated text video streams. 2. Is it possible to have hardware as character generator? Explanation: Character generators can be both hardware or software. Hardware character generators are used in television studios and video editing suites, whereas software CG(s) are used in animation. 3. Which type of character generators are used in television production studios? Explanation: Generally, only Hardware character generators are used in television studios. They provide a key signal. While the compositing vision mixer can use an alpha channel to determine which areas of the CG video are translucent. 4. Why aren’t camcorder CG used more frequently in the titler market? Explanation: They have 2 drawbacks, first is that you have to give titles as you shoot and second, they have very low capacity in comparison to others. 5. How many Methods of character generations are there? Explanation: There are three methods. Those 3 methods are Stroke method, Bitmap method and Starbust method. Each of them has different types of function. 6. Which method of character generation is also called Dot-matrix method? Explanation: Bitmap method is also called a dot-matrix method as it uses arrays of dots for character generation. These dots are the points for an array whose size is fixed. 7. In which method, graph is used in form of line to line? Explanation: In Stroke method, graph is drawn in the form of line by line. Line drawing algorithm DDA follows this method for line drawing. 8. In which method, fixed pattern of a line is used to generate characters? Explanation: In Starbust method, a combination of 24bit line segment is used. It is a method in which there is a particular pattern where only 24 strokes are defined for character generation. 9. Which method has the poorest character quality? Explanation: Character quality is poor in Starbust method and is worse for curved characters. Whereas in Bitmap method and stroke method, it is very good as they use new technologies. Explanation: Character generators can produce different type sizes and fonts depending on the requirement. You can alter the type, size as well as colour of fonts too using character generators. 11. Font colours can be changed using character generators. Explanation: Simple systems offer eight colours: black, white, yellow, red, magenta, blue, cyan and green. More sophisticated systems offer millions of colours.